The reign of William IV (1830-1837) was a relatively short one, but from a furniture history point of view it was important in that it marked the transition from the classical Regency Period to the more rococo Victorian Era. 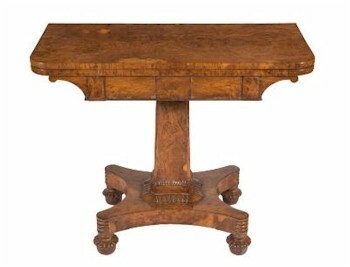 A William IV Burr Oak Rectangular Card Table (FS22/1101). Out would go the sabre and reeded leg on the dining chair and in would gradually come the cabriole leg. The designs on furniture became heavier with greater use of carving. Machines were also introduced. In the 'good old days' when online sales, the Internet and telephone bidding were not even dreamed of, it used to be said that antiques finished at 1837 and to be a proper antiques dealer you would only consider items prior to this date. Much has changed. The principal names in the William IV era were Nicholas Morel and George Seddon who began a partnership in 1827, although Morels' name disappears in 1831; the firm becoming G & T Seddon. Morel and Seddon were awarded the commission of refurnishing the apartments of Windsor Castle, worth some £200,000, although there appears to be a later dispute over payment of the account. The name of T Wilson can often be seen stamped on the tops of drawers in pieces of furniture. Thomas Wilson was recorded as being at 68 Great Queen Street, London as a furniture broker, auctioneer and appraiser from 1799-1854. 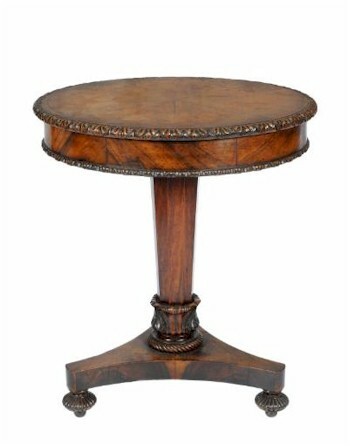 A William IV Carved Olivewood Circular Revolving Drum Top Occasional Table (SF19/1254). The name of Robert Jupe was also prominent in the reign of William IV most notably because in March 1835 he patented his design for 'an improved expanding table' – The Jupe patent dining table is one of the most sought after today, combining the skills of cabinet making and mechanical engineering, in a way heralding the great Victorian era that was to come. Amazingly these expanding tables were produced by Johnstone, Jupe & Co from early 1835-1840. Elsewhere in Scotland, the name of William Trotter of Edinburgh just makes the William IV era. William Trotter was one of the foremost Scottish cabinet makers of the early 19th Century. The era of William IV was also important in that more exotic woods such as rosewood and zebra wood were used.